At first, a dog bed seems like a great idea. However, it won’t take long before we realize that we need to keep it clean, and that’s when things get tricky. Luckily, there are some handy techniques you can use to keep your dog’s bed fresh and odor-free. About every week, it’s important to give your dog’s bed a routine cleaning. Not only will this cleaning cut down on dog odor and extra hair, but it will also discourage fleas and other unwelcome parasites from making a home there. First, give the bed a good shakedown outside. Larger beds can be hung from a clothesline and thumped with a broom to remove dust, dirt, and hair. Then, give your dog’s sleeping area a thorough sweeping and light treatment with a damp sponge mop and cleanser to help eliminate odors. 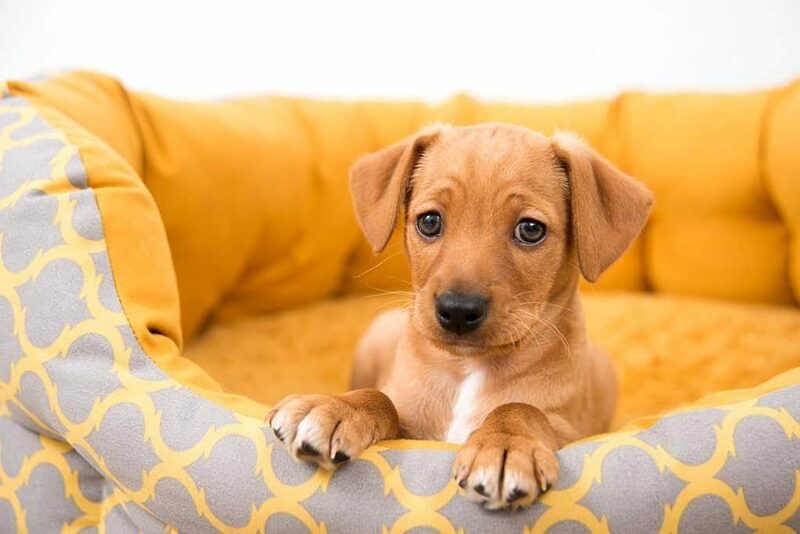 Before bringing in your dog’s bed, lightly run a damp sponge over the surface of the bed to pick up stray hairs. For extra freshness, spray the sponge with a diluted solution of a pet-friendly anti-odor formula. Every month, go beyond routine cleaning. Since the dog bed will need outside drying, look for sunny days to do a deep clean. First, shake off excess hair and dander. Shake out the foam cushion separately to get rid of dust or dirt. Next, wash the dog bed cover. If it can be machine-washed, clean the cover in hot water with mild detergent to kill any flea and tick eggs. If the bed cover isn’t machine-washable, fill your bathtub with hot water and mild detergent and soak the cover 15-20 minutes. Rinse carefully to prevent irritating your dog’s sensitive skin. The cover and foam mattress may need to be dried outdoors. Follow these steps for the foam padding. If it is machine-washable, use gentle detergent and hot water. Otherwise, re-fill your bathtub with hot water and gently work the detergent through the foam mattress to remove grime, and rinse until the water runs clear. Although some mattresses can be dried in the dryer, many need outdoor drying. Lay the clean mattress on a concrete surface. Avoid putting the mattress on grass, which can harbor fleas or other parasites, and let the mattress dry in the sun. Periodically move the mattress to a new spot until it thoroughly dries. To prevent mildew and mold, it’s better to over-dry the mattress than under-dry it. As usual, sweep and mop the area where the dog bed is usually placed. When the cover and the foam mattress are clean and dry, put the cover back on and re-establish the dog’s favorite sleeping area. Your pooch will love it as much as you do!